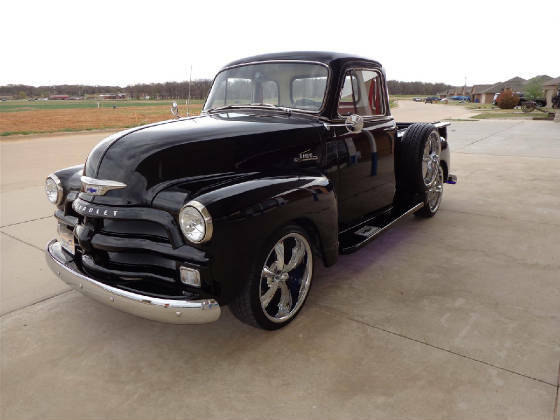 This month's Great Oklahoma Classic is a beautiful 1954 Chevrolet 3100 five window truck which belongs to Carlos and Jennifer Palacio of Stillwater Oklahoma. 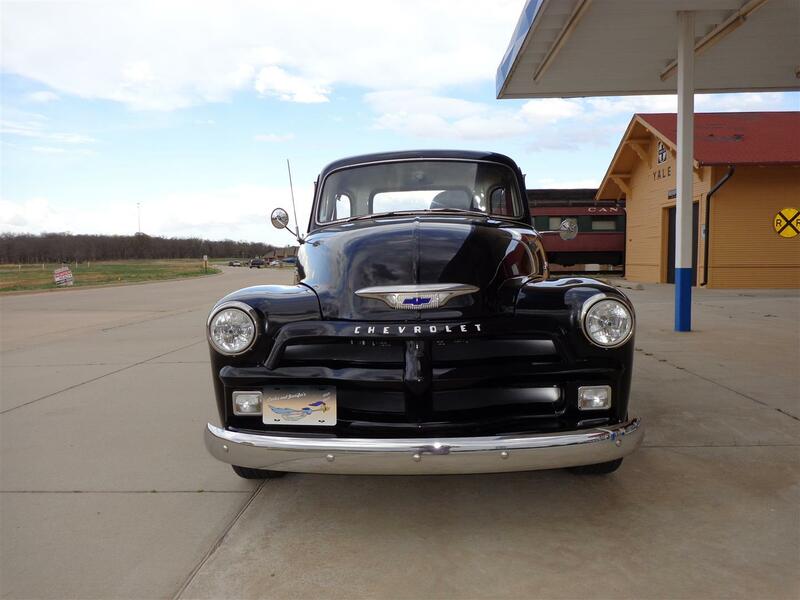 Carlos and Jennifer have owned this 1954 pickup for a little over three years and during this time the old classic has gone through a tremendous rejuvenation! They found the 1954 truck and the 1974 Nova donor car in Colorado. 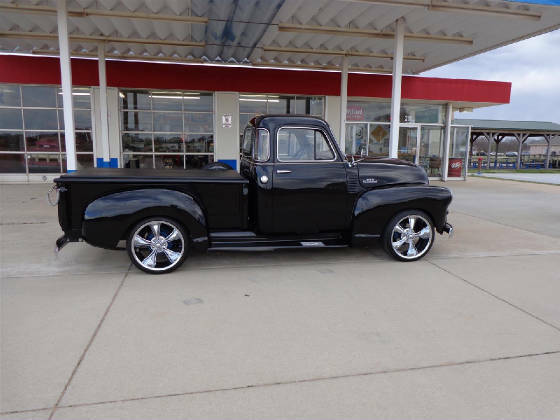 The truck has the original body with a C-10 frame. Carlos and Jennifer took the front end, the differential, the engine and transmission from a 1974 Nova. The body has been lowered in the front by 1 inch and in the rear by 3 inches. They added Air Lift wireless rear air bag system which can raise the back of the truck four inches when needed. The front has disc brakes while the rear has drums. The interior of this 5 window will make a person smile. It is painted Dupont Hot Hue Champagne. The door panels, seat and carpeting are well coordinated with the champagne and red colors. 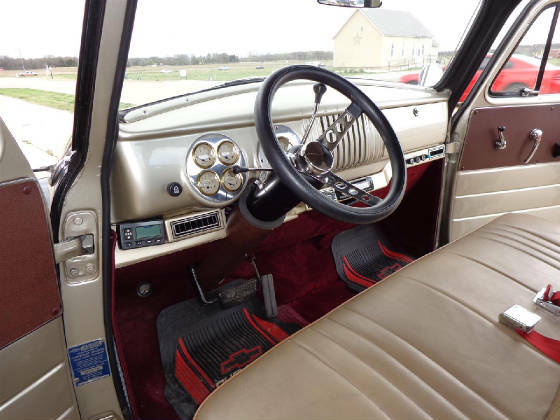 The dash has a set of custom Dolphin Gauges and the Palacios built a custom insert which is located under the dash which houses the stereo and the custom heat and air conditioning controls and air vents. This custom under dash insert also does a wonderful job of hiding all of the wiring. The stereo is a Pioneer Bluetooth system had two Rockford Fosgate eight inch Woofers and two six by nine three way Rockford Fosgate speakers all enhanced by a Rockford Fosgate 1500 watt amp. 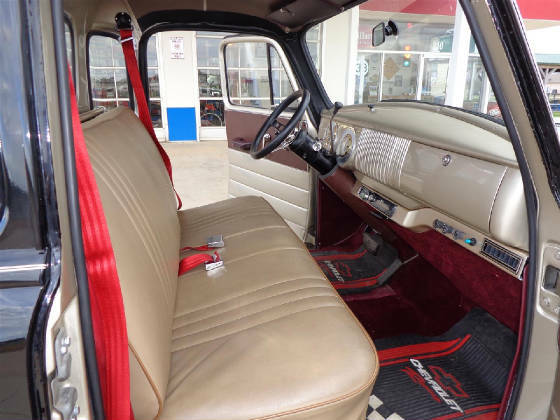 The speaker system is located where the original gasoline tank was located behind the seat. The new 19 gallon gasoline tank is under the bed in the rear but the original gas filler is still located in the original position. 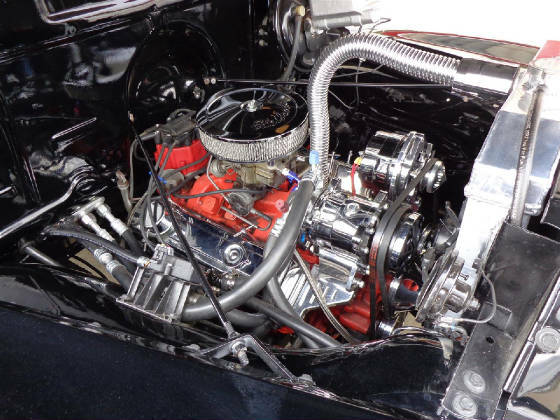 The engine is a Chevrolet 350 V8 with 700R4 automatic transmission. The "350" has been dressed up by adding chrome air cleaner, valve covers, alternator, air conditioning compressor and pulley system. The V8 is kept very cool by the custom three core high flow aluminum radiator. 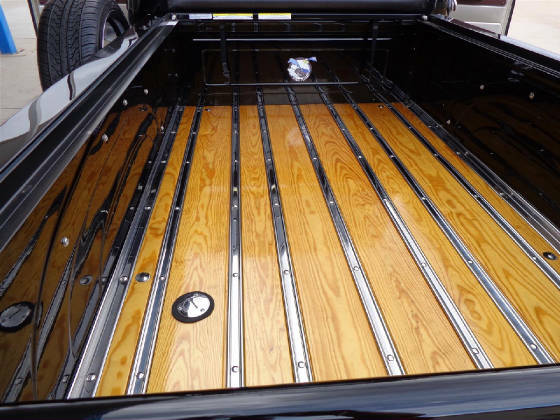 The wooden bed floor with stainless inlays is very impressive. 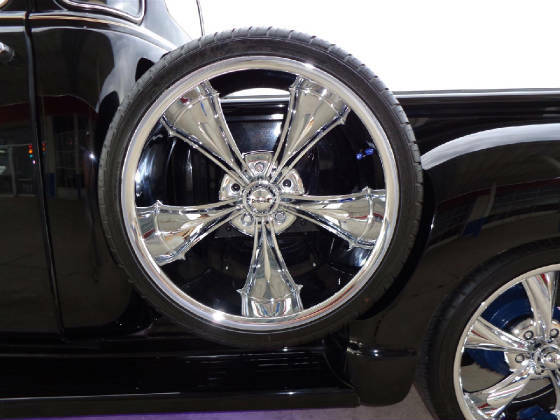 The five window classic rides on set of Crusade HP 235/35ZR20 tires mounted to chrome Ridler wheels. The impressive paint and body work for this classic was done in Colorado by Ken Starling. 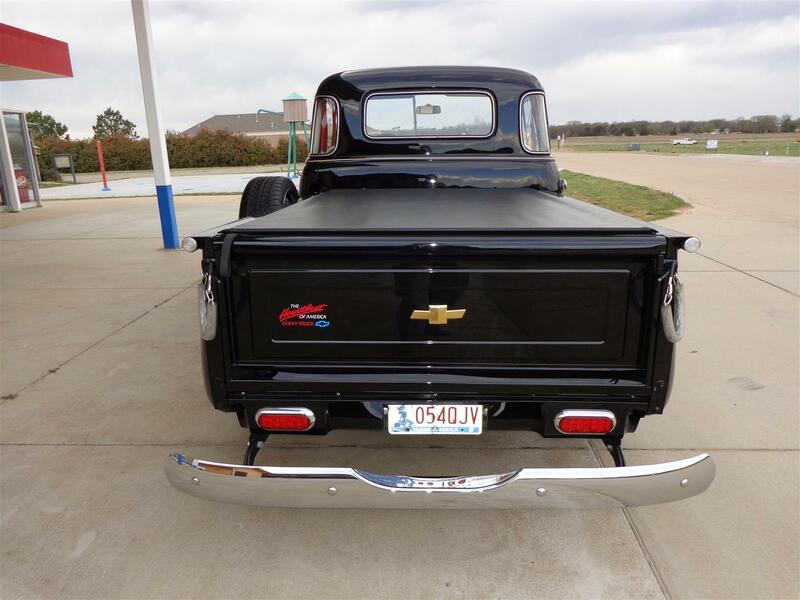 Ken used a Nason Full Base Black with a high solid clear coat and added a champagne pin stripe around the cab. The body looks very stock complete with the original Bullnose Grill and hood emblem and the side mounted spare tire holder. Carlos and Jennifer have enjoyed attended area car shows that benefit good causes and meeting new friends and other vehicle enthusiasts. Also, they have won a bunch of trophies with their beautiful 5 window classic truck! 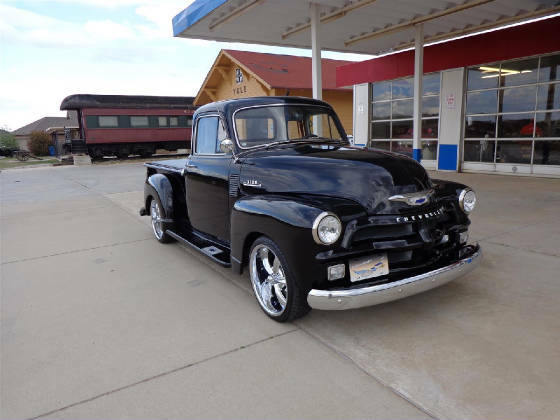 The Cimarron Starlite Cruisers sincerely thank Carlos and Jennifer Palacio for sharing their wonderful 1954 Chevrolet 3100 Five Window Truck as our Great Oklahoma Classic for April 2017!